I saw this quote posted on Instagram by one of the contestants on The Bachelor (guilty of stalking all top contestants) and it immediately stuck with me. I don't know if I'm alone in thinking this but ever since I've entered the "real world" I've found that I've been comparing myself to other people I know. Who has the better job. Who's been having more fun post grad. Who's been traveling to cooler places. Who got the promotion. Thinking like this can drive you insane. 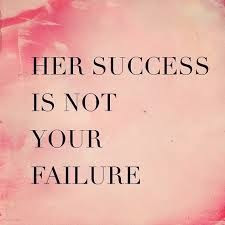 Her success is not your failure. If you're constantly comparing yourself to others you will miss out on your personal strengths. Keep this in mind next time you hear of a friend accepting a new position in LA, or your other friend who was able to buy herself a brand new car. Congratulate them on their accomplishments while focusing on yours as well.